In its most basic form, a cloud chamber is a sealed environment containing a supersaturated vapor of water or alcohol. When a charged particle (for example, an alpha or beta particle) interacts with the mixture, the fluid is ionized. The resulting ions act as condensation nuclei, around which a mist will form (because the mixture is on the point of condensation). The high energies of alpha and beta particles mean that a trail is left, due to many ions being produced along the path of the charged particle. These tracks have distinctive shapes (for example, an alpha particle's track is broad and straight, while an electron's is thinner and shows more evidence of deflection by collisions). 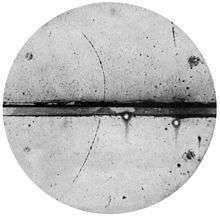 When any uniform magnetic field is applied across the cloud chamber, positively and negatively charged particles will curve in opposite directions, according to the Lorentz force law with two particles of opposite charge. Cloud chambers played a prominent role in the experimental particle physics from the 1920s to the 1950s, until the advent of the bubble chamber. In particular, the discoveries of the positron in 1932, the muon in 1936, both by Carl Anderson (awarded a Nobel Prize in Physics in 1936), and the kaon in 1947 (discovered by George Rochester and Clifford Charles Butler) were made using cloud chambers as detectors. Anderson detected the positron and muon in cosmic rays. Charles Thomson Rees Wilson (1869–1959), a Scottish physicist, is credited with inventing the cloud chamber. Inspired by sightings of the Brocken spectre while working on the summit of Ben Nevis in 1894, he began to develop expansion chambers for studying cloud formation and optical phenomena in moist air. Very rapidly he discovered that ions could act as centers for water droplet formation in such chambers. He pursued the application of this discovery and perfected the first cloud chamber in 1911. In Wilson's original chamber the air inside the sealed device was saturated with water vapor, then a diaphragm was used to expand the air inside the chamber (adiabatic expansion), cooling the air and starting to condense water vapor. When an ionizing particle passes through the chamber, water vapor condenses on the resulting ions and the trail of the particle is visible in the vapor cloud. Wilson, along with Arthur Compton, received the Nobel Prize in Physics in 1927 for his work on the cloud chamber. This kind of chamber is also called a Pulsed Chamber because the conditions for operation are not continuously maintained. Further developments were made by Patrick Blackett who utilised a stiff spring to expand and compress the chamber very rapidly, making the chamber sensitive to particles several times a second. A cine film was used to record the images. 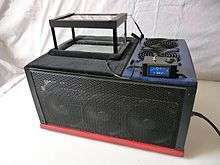 The diffusion cloud chamber was developed in 1936 by Alexander Langsdorf. This chamber differs from the expansion cloud chamber in that it is continuously sensitized to radiation, and in that the bottom must be cooled to a rather low temperature, generally as cold as −26 °C (−15 °F). Instead of water vapor, alcohol is used because of its lower freezing point. Cloud chambers cooled by dry ice are a common demonstration and hobbyist device; the alcohol used in them is commonly isopropyl alcohol or methylated spirit. There are also water-cooled diffusion cloud chambers, using ethylene glycol. A simple cloud chamber consists of the sealed environment, radioactive source (optionally), dry ice or a cold plate and some kind of alcohol source (it has to allow easy evaporation). Methanol vapor saturates the chamber. The alcohol falls as it cools down and the cold condenser provides a steep temperature gradient. The result is a supersaturated environment. The alcohol vapor condenses around ion trails left behind by the travelling ionizing particles. 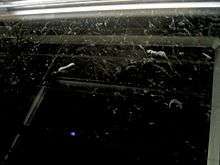 The result is cloud formation, seen in the cloud chamber by the presence of droplets falling down to the condenser. As particles pass through they leave ionization trails and because the alcohol vapor is supersaturated it condenses onto these trails. Since the tracks are emitted radially out from the source, their point of origin can easily be determined. Just above the cold condenser plate there is an area of the chamber which is sensitive to radioactive tracks. At this height, most of the alcohol has not condensed. This means that the ion trail left by the radioactive particles provides an optimal trigger for condensation and cloud formation. This sensitive area is increased in height by employing a steep temperature gradient, little convection, and very stable conditions. A strong electric field is often used to draw cloud tracks down to the sensitive region of the chamber and increase the sensitivity of the chamber. While tracks from sources can still be seen without a voltage supply, background tracks are very difficult to observe. In addition, the voltage can also serve to prevent large amounts of "rain" from obscuring the sensitive region of the chamber,caused by condensation forming above the sensitive area of the chamber. This means that ion trails left by radioactive particles are obscured by constant precipitation. The black background makes it easier to observe cloud tracks. Before tracks can be visible, a tangential light source is needed. This illuminates the white droplets against the black background. Drops should be viewed from a horizontal position. If the chamber is working correctly, tiny droplets should be seen condensing. Often this condensation is not apparent until a shallow pool of alcohol is formed at the condenser plate. The tracks become much more obvious once temperatures and conditions have stabilized in the chamber. This requires the elimination of any significant drift currents (poor chamber sealing). The bubble chamber was invented by Donald A. Glaser of the United States in 1952, and for this, he was awarded the Nobel Prize in Physics in 1960. The bubble chamber similarly reveals the tracks of subatomic particles, but as trails of bubbles in a superheated liquid, usually liquid hydrogen. Bubble chambers can be made physically larger than cloud chambers, and since they are filled with much-denser liquid material, they reveal the tracks of much more energetic particles. These factors rapidly made the bubble chamber the predominant particle detector for a number of decades, so that cloud chambers were effectively superseded in fundamental research by the start of the 1960s. The newer spark chamber is an electrical device that uses a grid of uninsulated electric wires in a chamber, with voltages applied between the wires. Microscopic charged particles cause some ionization of the air along the path of the particle, and this ionization causes sparks to fly between the associated wires. The presence and location of these sparks is then registered electrically, and the information is stored for later analysis, such as by a digital computer. Similar condensation effects can be observed as Wilson clouds, also called condensation clouds, at large explosions in humid air and other Prandtl–Glauert singularity effects. ↑ "The Nobel Prize in Physics 1936". Nobelprize.org. Retrieved 7 April 2015. ↑ "The Nobel Prize in Physics 1927". www.nobelprize.org. Retrieved 2015-04-07. ↑ Frisch, O.R. Progress in Nuclear Physics, Band 3. p. 1. 1 2 3 4 Zani, G. Dept. of Physics, Brown University, RI USA. “Wilson Cloud Chamber”. Updated 05/13/2016. ↑ "The Nobel Prize in Physics 1960". www.nobelprize.org. Retrieved 2015-04-07. Das Gupta, N. N.; Ghosh S. K. (1946). "A Report on the Wilson Cloud Chamber and its Applications in Physics". Reviews of Modern Physics. 18 (2): 225–365. Bibcode:1946RvMP...18..225G. doi:10.1103/RevModPhys.18.225. Wikimedia Commons has media related to Cloud chambers. "Cloud Chambers". Archived from the original on 30 June 2008.